Hand finished in FSC Certified Teak this gate leg table with an octagonal shaped tabletop really looks the part. With rounded edges and smooth bevels at either end of the uprights and on the feet it’s highly attractive and functional as well. The finish throughout is smooth and easy on the eye and, when bought in bulk, it will add character to any commercial setting or simply sit in its own right as a little something different when used domestically. And the crafts people responsible for the design have intentionally left space between the folding gate leg to accommodate this - a great attention to detail along with the teak plug that completes the table top when the parasol isn’t in use. Each folding leg locks in place with a simple catch and all fittings are made from brass which compliments the honey coloured lustre of the teak to great effect. The high oil content and dense grain found naturally in teak are in many ways its greatest feature as they negate the need to use any form of external protectors against the elements. Left untreated the timber will simply weather to a silver-grey patina, a very familiar trait that is loved by so many. However, this can be removed to keep the golden lustre and is best done on a warm day with mild soapy water, a stiff-bristle brush and some elbow grease. 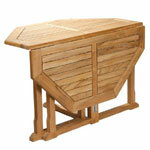 Alternatively, you can take a look at our range of Teak Care Products. If further information is needed then please feel free to speak to our friendly Sales Team in the Midlands who are always happy to help.